The medication may be a promising shot at a cure because it can work against various strains of the virus and is cheap to make, experts say. It works by sticking to the flu virus to stop it being able to attack the body’s cells and trigger the illness. The drug’s developers say they have already seen it successfully ‘neutralise’ flu infections in lab tests and even mice protect mice from usually-fatal doses of the virus. Scientists at the pharmaceutical company Janssen in the Netherlands are developing the drug, currently only known as JNJ4796. When they tested the drug on mice and gave the animals a dose of flu 25 times higher than would usually kill them, they survived, the New Scientist reported. JNJ is a medicine which mimics antibodies – proteins in the blood which attach to invading viruses and destroy them. The body produces antibodies naturally when it is exposed to an infection, but this can take days and not happen quickly enough to avoid someone becoming sick. By putting this new drug into a pill, doctors could produce an antibody effect when someone is diagnosed, which could be quick enough to stop the illness taking hold. 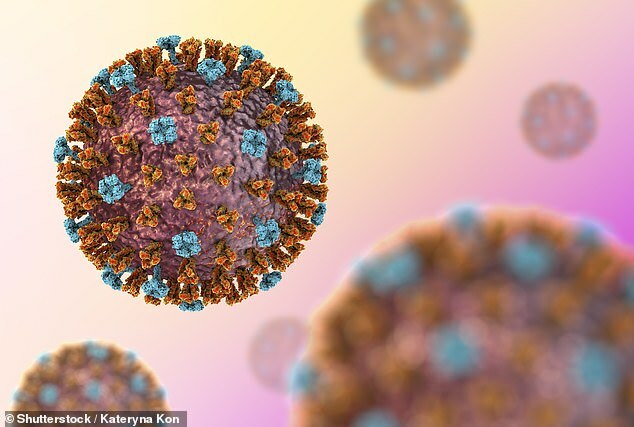 ‘[This] holds promise as an urgently sought-after therapeutic option offering a complementary [treatment] to existing antiviral drugs,’ the researchers wrote in the journal Science. It is already possible to fight viral infections by injecting antibodies, but they can be costly to make and do not usually work on more than one strain of an infection. This means new batches need to be made every time a virus mutates which, when it comes to flu, tends to happen every year. But JNJ’s developers say it targets a part of the flu virus which barely changes between strains, meaning it could be an all-in-one pill able to fight various types. And the new technique could pave the way for developing other antiviral drugs in future, by removing the need to recreate expensive antibodies, and overcoming the problem of changing strains. Janssen now plans to continue testing its drug and find out whether it is safe for humans to use.